"WORLD'S MOST POWERFUL X-RAY LASER OPENS WITH A FLASH"
The X-Ray Free-Electron Laser (XFEL) which stretches 3.4 km (2.1 miles) beneath the German city of Hamburg has officially began operations. XFEL is capable of flashing 27,000 laser beams per second with each one a billion times brighter than that of a normal x-ray source. In fact, the X-rays are so powerful that it could be utilized to capture images of individual atoms. The new facility will be utilized by scientists from eleven countries to research the molecular composition of viruses and cells while also taking three-dimensional images of the universe on a nano-molecular scale. Furthermore, it will help uncover the processes occurring deep within the interiors of planets and in elusive chemical reactions. The X-ray laser is generated from an electron beam directed through a unique superconducting linear accelerator. 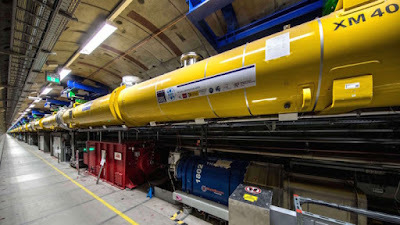 Within a specific 2.1km-long section of the tunnel, electron pulses are accelerated to near-light speed before entering a tunnel containing 17,290 permanents magnets with alternating poles where the X-rays are created.